If someone had asked me to eat greens for my breakfast five years ago, I would have raised my eyebrows in disgust. Breakfast weren't green. Breakfasts were bland, beige, brown colours of porridge and banana, or toast and tea. Maybe perhaps a dash of orange egg yolks, red baked beans, pink bacon, or even a few bright red strawberries scattered on my Weetabix. 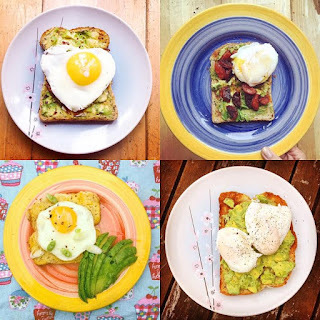 But the Aussie 'avocado smash' trend which swooped through the capital the last couple of years has now settled on menus far and wide, opening up peoples' minds to the idea of eating veggies for breakfast. Spinach or kale are great choices for morning toast toppers, but don't think adding greens will automatically make your brekkie healthy, just take eggs florentine - wilted spinch on a doughy muffin, slathered in rich hollandaise sauce - not really one of your five a day. Try sprinkling spring onions on your scrambled eggs, experiment with courgette and bacon in frittatas, green juices or smoothies, even matcha tea is green. Green is good. And I always think, if you're ever in doubt, lay a poached egg on top and voila, breakfast is served. Take the flesh of one ripe avocado and place into a bowl. Smash the green flesh with the back of a fork and heartily season with salt and pepper to taste. Add a grind of chilli flakes and a squeeze of lime and combine. Start frying a few chunks of chorizo and put an egg on to poach while toasting a slice or two of your favourite bread. Once the toast is nice and golden, spread the avocado mixture on top. Take spoonful of yoghurt or cream cheese and marble through the avocado smash. Top with a poached egg, crispy chorizo, another grind of salt and pepper and a healthy drizzle of chilli oil.